Objective: Post traumatic stress disorder (PTSD) is an important diagnosis in the Veterans Affairs Health System, where obesity is common. There is little available data describing the impact of PTSD on outcomes following weight loss surgery in morbidly obese patients. Conversely, the mental health effect of weight loss surgery in these patients is unclear. In this study we explore the relationship between PTSD and long term weight loss success after Roux-en-Y gastric bypass for morbid obesity. Also we sought to evaluate the changes in symptoms and treatment of PTSD after surgical weight loss. 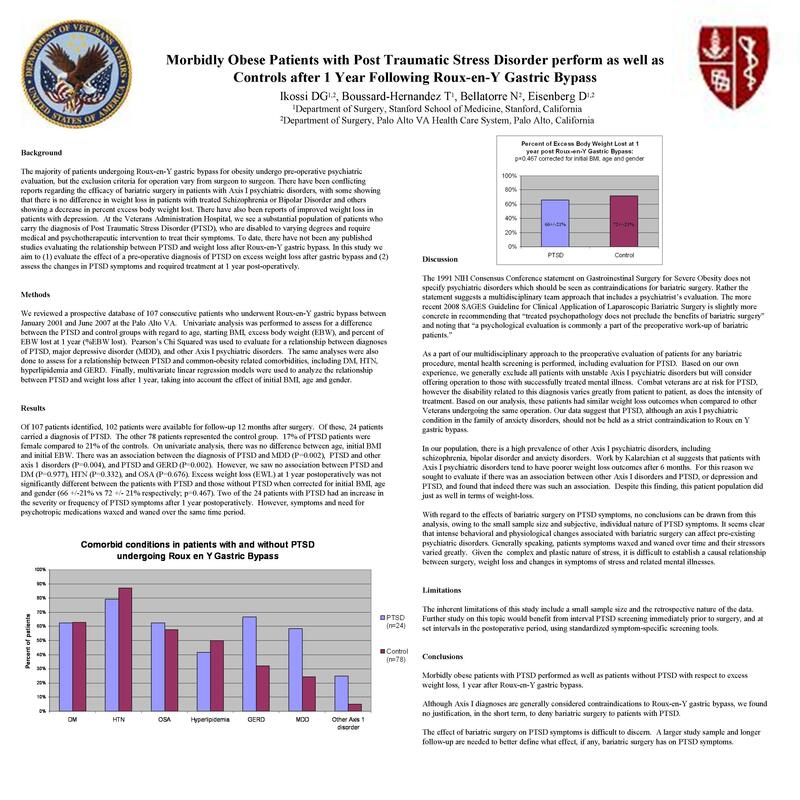 Methods: We reviewed a prospective database of 107 consecutive patients who underwent bariatric surgery between January 2001 and June 2007 at the Palo Alto VA. Multivariate linear regression models were used to analyze the relationship between PTSD and weight loss after 1 year, taking into account the effect of initial BMI, age and gender. Results: Of 107 patients, 103 patients were available for follow-up 12 months after surgery. Of these, 16 patients carried a diagnosis of PTSD. The other 87 patients represented the control group in this study. All the patients with PTSD were male, while 78% of the control group were men. Excess weight loss (EWL) at 1 year postoperatively was not significantly different between the patients with PTSD and those without PTSD (60+/-17% vs. 73%+/-22%, respectively; p=0.24), when corrected for initial BMI, age and gender. Two of the 16 patients with PTSD had an increase in the severity or frequency of PTSD symptoms after 1 year postoperatively. However, symptoms and need for psychotropic medications waxed and waned over that time period. Conclusions: Morbidly obese patients with PTSD performed as well as patients without PTSD with respect to excess weight loss, 1 year after Roux-en-Y gastric bypass. Although DSM Axis I diagnoses are generally considered contraindications to Roux-en-Y gastric bypass, we found a difference that was not statistically significant between patients with PTSD and those without PTSD. Therefore, with respect to weight loss, we do not believe that PTSD is a contraindication to gastric bypass in the morbidly obese. The effect of bariatric surgery on PTSD symptoms, however, is more difficult to discern. A larger study sample and longer follow-up are needed to better define whether bariatric surgery has a positive or negative effect on the mental health of patients with PTSD.